Each time I visit Paris, I have a myriad of people, places, restaurants, and sites fluttering around in my head–my “must-do” list. Even after living there for nearly two years there are still things I need to see, and of course, spots to revisit. A recent return to the beloved city inspired me to reflect on a few of my personal highlights or things I find requisite to enhance a Parisian getaway. Well, okay…”requisite” after you have seen Madame Tour Eiffel sparkle in the evening, waived hello to Ms. Mona Lisa while twelve rows back, on your tippy-toes in the Louvre, retraced the steps of Quasimodo in Notre Dame and shopped until you dropped along the Champs-Élysées…you know, the Paris 101 stuff. My tip: Work on charming your server so you may get a tour of their 500,000 bottle wine cellar, guarded around the clock. And go at lunch, like the Parisians. Read more about my experience at La Tour d’Argent. This impressionist and post-impressionist art gallery in Jardin des Tuileries is my favorite. It might not be in a cool old train station like the nearby Musee d’Orsay, but the transformed orangery is home to Claude Monet’s eight Nymphéas murals. Each time I visit the large canvases, I get lost in the dreamy images and brush strokes. Their size and perfection is overwhelming. I like to imagine an elegant dinner party taking place in these rooms. A long white table, dancing candlelight and sparkling drinks surrounded by a master’s impressive impressions of a garden in Giverny. Everything would indeed taste better. My tip: Go on the first Sunday of the month when museums are gratuits (free) to enter! Check out the Musée de l’Orangerie website for more info. Oh, the flea markets of Paris! In a city that is itself considered a treasure, you can head to Les Puces to hunt for a piece of the loot to take home! Warning: I was completely overwhelmed the first time I went. It is quite vast and at times, I felt like I was shopping in Napoleon’s apartment at the Louvre, rather than a “flea market” (with price tags to match). But don’t be daunted! The assortment of beautiful, vintage and unique items will dazzle you! Some items are a bargain too. My favorite finds are a 1940s mink stow for 40 Euro and the most adorable late-1800s salières from the oldest crystal manufacturer in Europe, St. Louis, for 88 Euro. My tip: Charm the vendors with a bit of French so they sweeten the deal! Here is some more info on Les Puces. Really there is nothing more Parisian than sitting at a café and basking in la joie de vivre. Do it with a glass of Cote de Provence Rosé and it will appear as if the routine is just what you do on a regular Tuesday. La Contrescarpe in Place de la Contrescarpe near the Panthéon was a favorite for my friends and me to gather, sit and sip. Enjoy people-watching at its best in this young, hip Left Bank neighborhood (although an eclectic older woman named Franciose stole the show most times we went observing!). An additional highlight is that Ernest Hemingway’s first Parisian apartment is steps away from the place. Perhaps he would be charmed by the present-day plaza that once was home to the café he described as “the cesspool of the rue Mouffetard,” or perhaps not… but I know you will be! My tip: Order food so you can get a carafe of the rosé versus just a glass…who’s in a hurry anyway?! Click here for more info about La Contrescarpe Cafe. I debated adding death to a list of must-do things in a city renowned for its art of enjoying life, but my solitary time in Paris’ catacombs was so profound that I couldn’t deny it. The hundreds of kilometers of tunnels that make up Paris’ underbelly first started out as limestone and gypsum mines which were quarried to build the likes of the Louvre and Notre Dame. Today it is home to the bones of over 6 million Parisians. The artfully displayed femurs and skulls along with the placards of literary and biblical quotes that reinforce our limited time on this planet created a sight and sensation I will never forget. And I don’t expect there will be another time in my life during which I enter a sanctuary displaying the cautionary greeting, “ARRÊTE, C’EST ICI L’EMPIRE DE LA MORT” (Stop! This is the empire of death!). The history of this underground is fascinating. My tip: Go in January or February when tourists are minimal. There were moments during my visit when I was completely alone with Paris’ predecessors; it made for a very haunting experience, proceeded by obligatory drinks! Read about my tour of the catacombs and how to get there. Voila! 5 Choses à Faire! 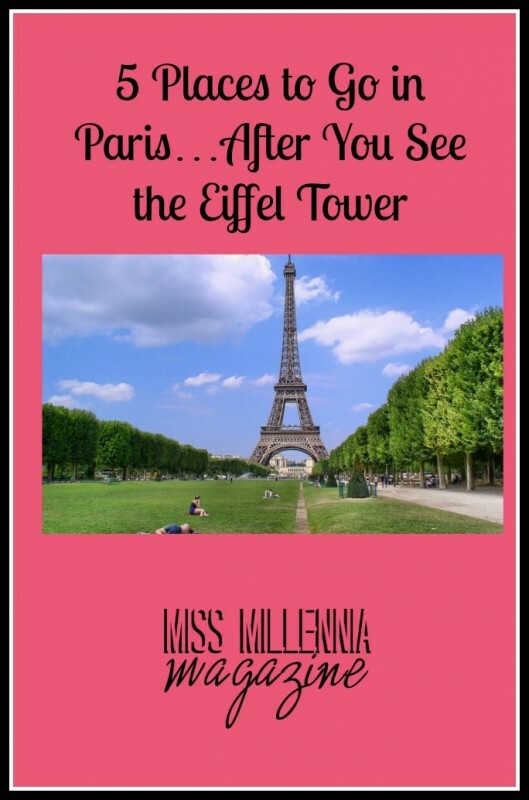 But DO make sure you see the Eiffel Tower first. And if you do these all, please celebrate with a Baba Au Rhum or Tarte Au Citron at Jaque Genin’s Patisserie in the 3eme. Nothing like a delectable pastry from one of the world’s top chefs de pâtisserie to give yourself a pat on the back!